Injured in a truck accident? We can help. Thousands of trucking and 18-wheeler accidents occur each year in California alone, resulting in serious injuries and death. Victims who survive trucking accidents are often left with enormous medical bills, temporary or permanent disability and chronic pain. If you have been injured in a truck accident, you may be entitled to compensation for your pain and suffering from the trucking company, the truck driver, the truck manufacturer, and other parties responsible for your injuries. Over the last 27 years, Laureti & Associates, A.P.C. has helped countless victims of truck accidents recover compensation for their injuries. Use this form to schedule a free consultation. We will discuss your truck accident injuries and create a legal strategy that will help you recover financially. We represent clients on a contingency fee basis, meaning you do not pay unless we recover compensation for your injuries. if you are injured in a truck accident, what are you entitled to? If you were injured by a commercial truck or 18-wheeler, you may be entitled to compensatory damages for physical and emotional pain and suffering, loss of enjoyment of life, past and future medical bills, lost wages, loss of income, and the inability to earn future income. You may also be eligible for punitive damages, which is a form of damages designed to punish the truck company or driver. Every trucking accident case is different, but if your injuries were caused by a commercial truck or 18-wheeler, then we can build a successful case. Who is responsible for your injuries after a truck accident? Commercial truck accidents are much more complex than other motor vehicle accidents. Multiple parties may share responsibility for your injuries, such as the truck driver, the truck manufacturer, the owner of the truck, and the dispatching company. Regardless of your situation, our legal team will investigate your case, determine who is liable for your injuries, and pursue the best path forward to your financial recovery. WHAT DO YOU NEED TO PROVE TO RECOVER COMPENSATION FOR A trucking accident? Simply put, you need to prove that the truck driver, trucking company or truck manufacturer caused your injuries in order to have a successful personal injury claim. Commercial trucking companies often use their own legal teams to minimize their liability to you. Following an accident, trucking companies send their own investigators and attorneys to evaluate the accident scene. Laureti & Associates, A.P.C. have been leveling the playing field for truck accident victims for over two decades. We conduct our own investigation into your case, holding accountable all parties responsible for your injuries. An 18-wheeler can weigh up to 40 tons. A car can weigh less than two tons. When the two collide, it can spell disaster for the car driver and passengers. Trucking companies place a premium on cost savings and quick shipments, and sometimes safety concerns are overlooked. Truck drivers may speed, fail to follow the rules of the road, drive distracted, or drive for days on end with little rest. If you have been injured by a commercial truck or 18-wheeler, you may be entitled to recover compensation for your injuries, property damage, and pain and suffering. Anthony Laureti is a San Diego personal injury attorney with over 27 years of experience representing victims of truck accidents. By preparing each truck accident case for trial, Laureti and his legal team have successfully represented numerous truck accident victims, helping them receive the financial resources they need to make a full recovery. The details of every truck accident that our legal team works with is different. Laureti & Associates, A.P.C. investigates every accident, working hard to ensure you receive fair compensation from those responsible for your injuries. We also work with truck accident victims on a contingency basis, meaning that our clients do not pay unless we win. Under California law, there are time constraints, known as the Statute of Limitations, in which you must pursue your personal injury claim. If you delay filing your claim too long, you may forfeit your right to pursue compensation for your injuries. Contact the personal injury team at Laureti & Associates, A.P.C. today to schedule a free consultation. Our team is standing by to answer your questions and determine the best path forward to financial recovery. Thank you for doing such a fabulous job and being in constant communication with me. Thank you for having integrity and being someone I could trust. I will tell everyone how great you are and I'm sure I'll need your services again in the future. Thanks for all of your help and dedication. It was apparent to me that you were always on the ball. I really appreciated that, knowing that this was such a small case. I will definitely be in contact with you for any other legal matters I may have. Thank you for your wonderful service and being nice and kind. You were very helpful in everything you did for me, and my family. Tony was the best ever. He was responsive and would answer any questions I had right away. I have had experiences with lawyers who would act like you were bothering them when you had questions. He made me feel like he was treating my case like it was his most important case. Not one complaint and I tell anyone who asks if I know an Attorney about Tony. Thank you again. 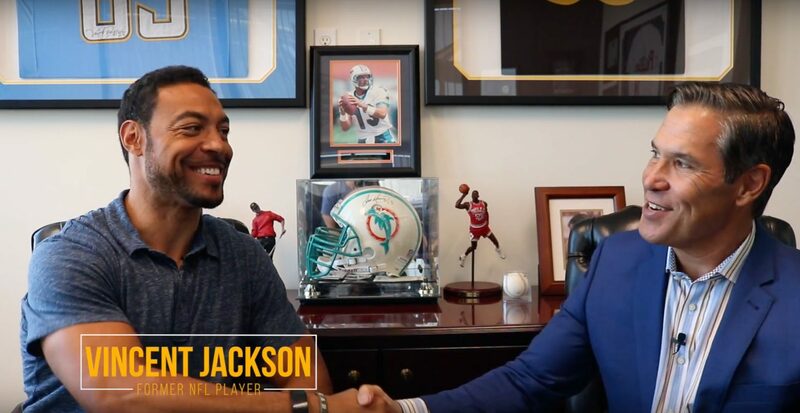 Tony hangs out with recently retired NFL wide receiver Vincent Jackson to talk about football, business and the Jackson in Action 83 Foundation. 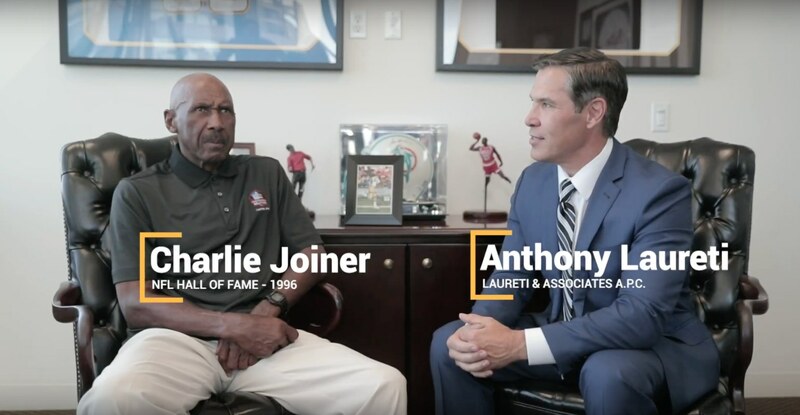 Tony sits down with NFL Hall of Famer and former San Diego Charger wide receiver Charlie Joiner to talk about football and life in San Diego. 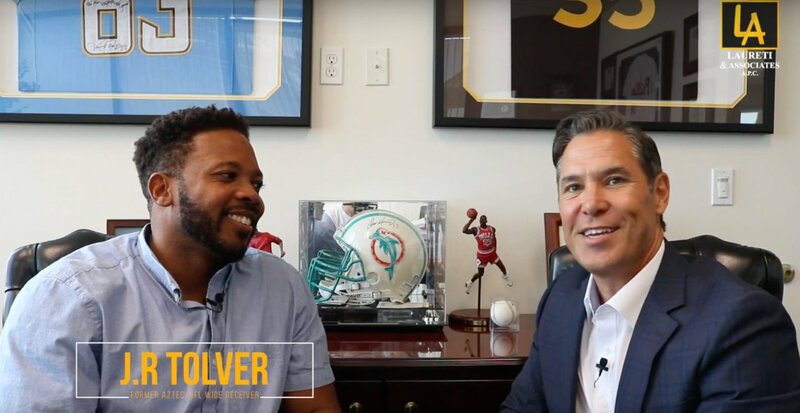 Tony and fellow San Diego State alum and former Aztec wide receiver J.R. Tolver talk college football and, one of our office's favorite topics, insurance. Wildfires can cause devastation beyond emotional distress and physical injury. In light of the recent Camp Fires that ravaged Northern California, thousands of individuals are displaced by their homes and facing financial distress. Every year, more than 4.5 million people are bitten by dogs the United States, and more than 800,000 receive medical attention for dog bites, according to the U.S. Centers for Disease Control. The majority of these dog bites are preventable. If you have questions, need the advice of a trusted counselor, or simply do not know where to turn, our team is here to help. Contact us today to schedule a free consultation. DISCLAIMER: The information contained on this website is intended to introduce prospective clients to Laureti & Associates, APC, and is not to be considered a legal opinion or an offer to represent you. This web site is not intended to establish an attorney-client relationship. Emails sent to Laureti & Associates, APC using any of their email addresses, through the use of this website, would not be confidential and would not create an attorney-client relationship. Copyright © Laureti & Associates, A.P.C.